The new one-year pilot scheme has been developed in partnership between the department of social protection and the department of arts, heritage, regional, rural and Gaeltacht affairs, in consultation with Visual Artists Ireland and The Irish Writers Centre. The Irish government has launched a new pilot initiative that acknowledges the professional status of self-employed visual artists and writers applying for Jobseekers Allowance. 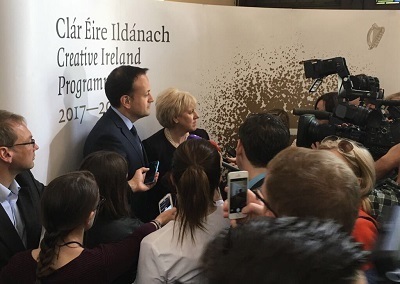 The pilot has been developed in partnership between the department of social protection and the department of arts, heritage, regional, rural and Gaeltacht affairs, and forms part of a key commitment to artists under the Creative Ireland programme. It will recognise within the existing social welfare system that ‘actively looking for employment’ includes artists who are applying for commissions, exhibitions, curatorial visits, outreach work and other related opportunities. Speaking at the launch of the initiative at Poetry Ireland‘s new headquarters in Dublin, arts minister Heather Humphreys said: “Artists are at the very centre of the Creative Ireland programme, and I have been particularly keen for some time now to do more to recognise the income challenges faced by artists. Humphreys added that the initiative had been developed with support, input and guidance from the Arts Council of Ireland, Visual Artists Ireland and The Irish Writers Centre. Fine Gael Leader and minister for social protection, Leo Varadkar, commented: “I believe it is only right that we allow for some flexibility within the social welfare system to allow artists to access social welfare supports when they need them. Up to now, artists have found it difficult to access social welfare and of course many artists take on extra jobs to support their livelihoods. The scheme will be facilitated by Visual Artists Ireland and The Irish Writers Centre. Both organisations are approved to certify the professional status of visual artists and writers through their respective professional membership schemes. Noel Kelly, CEO of Visual Artists Ireland, said the organisation welcomed the announcement and thanked the staff of both government departments involved “for the opportunity to discuss in detail how this new recognition of visual artists as professionals can work to the benefit of the many”. Kelly said the scheme would be monitored by VAI and that conversations would continue with both government departments “to ensure that the visual artist’s voice will continue to be central to the conversation”.